I thought this would make a fun and whimsical painting to include in my upcoming bird art exhibit. 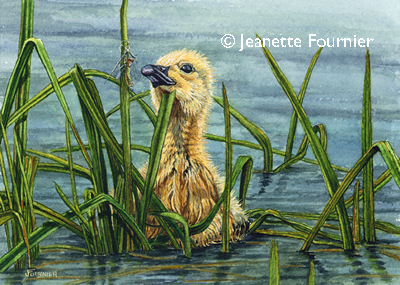 I’ve titled it “In The Weeds”, and depending on your perspective, could be referring to the duckling or to the bug, getting a closer inspection by the duckling. Some days you’re the bug…and some days you’re the duckling, right?! This entry was posted in Exhibitions, Finished Art Work, Uncategorized and tagged bird art, Bryan Memorial Gallery, duck art, duckling, Franconia Notch, NH Artist, vermont artist, vermont watercolor society, watercolor art, white mountain artist. Bookmark the permalink.